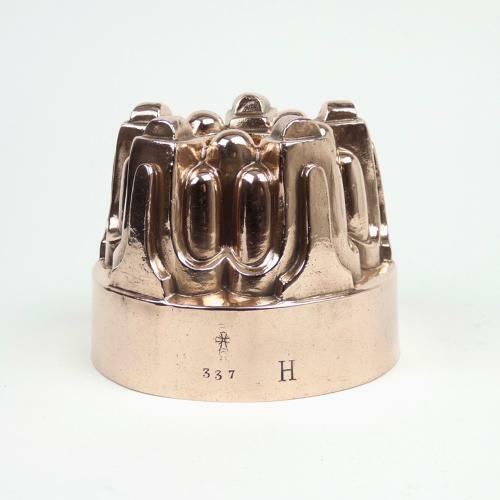 A good quality, Victorian copper mould with an elaborate, architectural design. This mould is stamped with the orb and cross symbol used by Benhams, above the pattern number '337'. It also has a large, engraved letter 'H' which would have been the initial of a previous owner. It is made from a very heavy gauge of copper and it dates from c.1870. The design consists of five angular columns with scalloped bases, which are divided by five smaller, dome topped columns. This is all around a central pipe. There are a few dents to some of the high points of the mould but other than that it is in very good condition. The tinning, to the interior, is worn.